This past summer I had the pleasure of traveling to the Greek island, Ios. 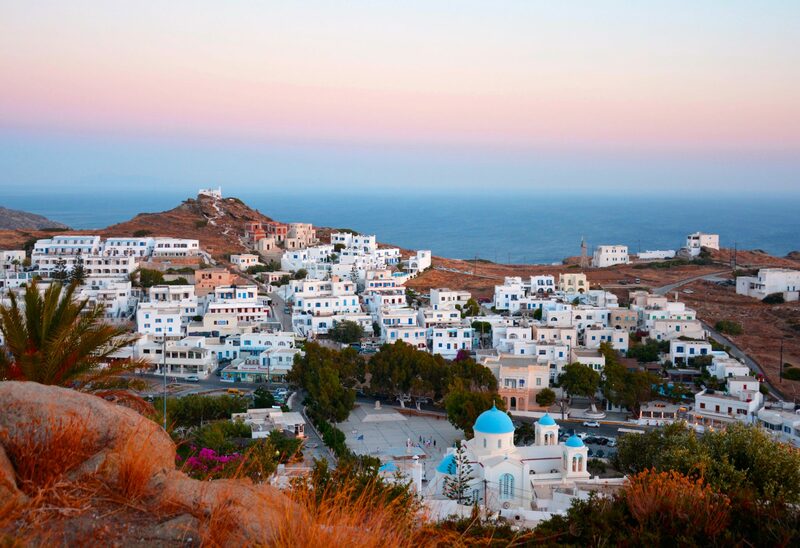 Ios is part of Cyclades, a group of islands in the Aegean Sea, which, include Mykonos, Santorini, and many other. 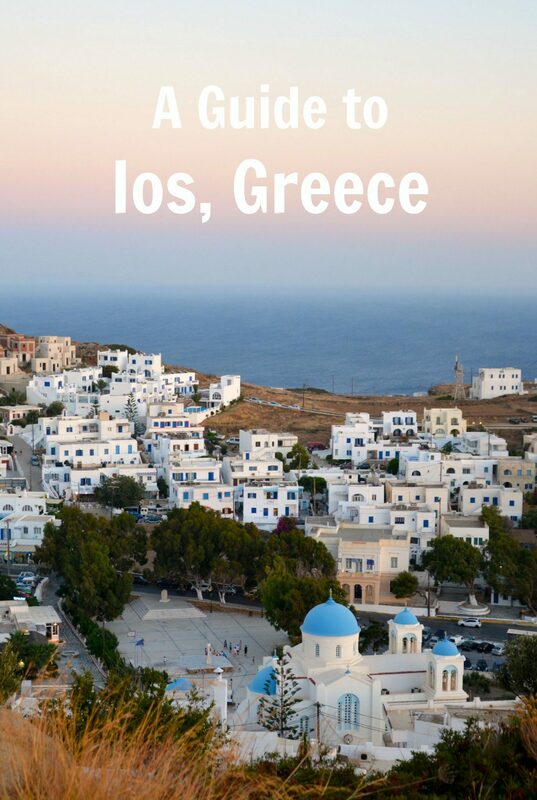 Ios is halfway between Naxos and Santorini. With a length of 18 kilometers (11 miles) and width of 10 kilometers (6 miles), it is not a very big island, but it has plenty of beaches and places to explore to last you several days. I ended up staying for one week, and I can proudly say, I did not get bored of this tiny, charismatic island. Not only is it one of the most gorgeous islands I have visited, but the locals are very friendly. Even though Ios has a reputation of being a party island, it is certainly not limited to only its party scene. I visited with my boyfriend, so we definitely did not go there to party. Nevertheless, we actually enjoyed having the beaches to ourselves (hung over partiers are not so interested in exploring the island), so it definitely has its upside! 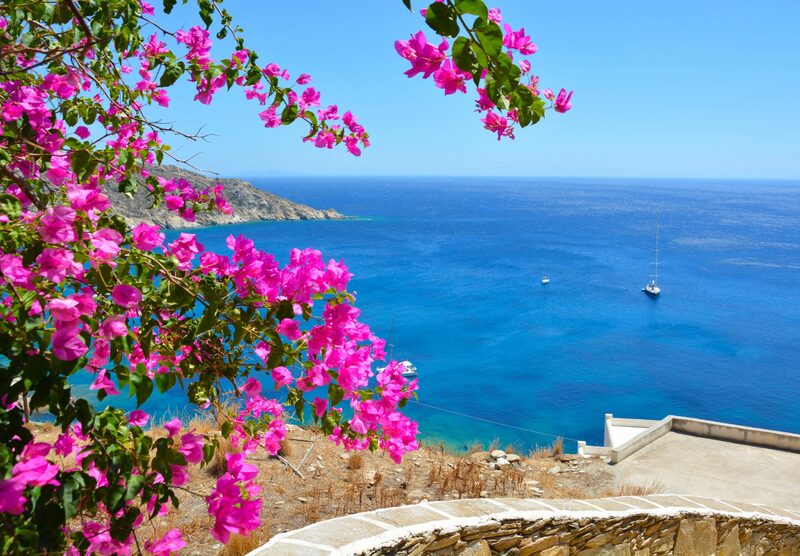 When one thinks of Greece, their mind immediately goes to little white houses, crystal clear blue waters, and endless hours of sunshine. Ios certainly does not disappoint. 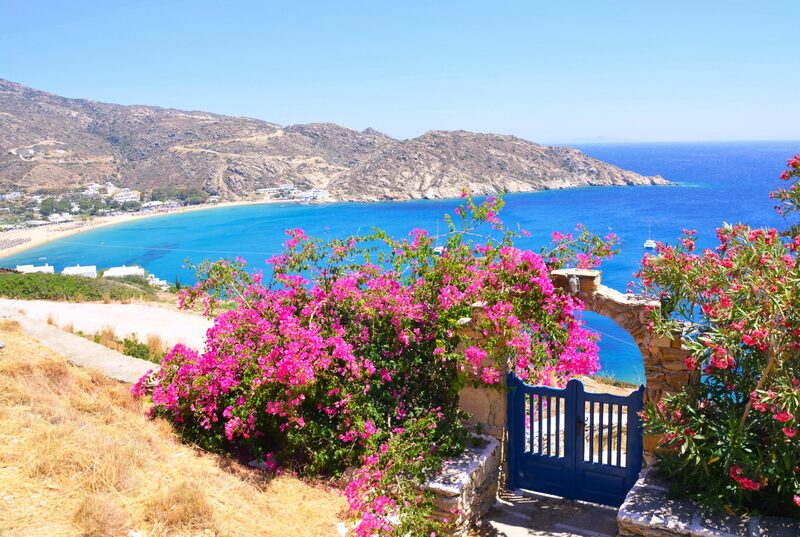 It is surrounded by beautiful beaches, the main village, Chora is situated on a hill filled with little white houses overlooking the island, and the weather? Yup, make sure to bring enough sunscreen with you if you plan to visit during the summer. Another notable characteristic of Ios is it’s violet flowers. They can be found all over the island, painting the whole island a violet color. In fact, one of the many theories for the name of this island, is that it derivers from the Ancient Greek word, “la”, meaning flowers. Although there is no airport in Ios, there are several ways to arrive to the island. If you are traveling from northern Greece (i.e. Thessaloniki) or from another country you can find cheap flights to Athens with Ryan Air. From there, you can take the metro to Piraeus Port, where you have several boat options, including high speed found here. If you have time to see two islands during your vacation, I recommend visiting Santorini first (either by boat or by plane), spend a few days there and then take the ferry boat from Santorini to Ios. The boat ride is only 35 minute by high speed and an hour and a half by regular speed. The price of the ticket ranges from 7 euros for regular speed, to ~30 euros by high speed, depending on the time of day and the season. I highly recommend renting a car to explore the beaches that are far away from Chora. Although there are several car rental companies found on the island, we were pretty satisfied with Europcar. If cars are not your thing, you can also rent motorcycles or ATV’s (although I do not recommend ATV’s as they have been proven to be unsafe). There is also a local bus service, with tickets being 1 to 2 euros that takes you to all the touristic beaches. Keep in mind though, that your options are limited if you depend on the bus. Most hidden gems of the island are yet to be discovered by tourists! Lastly, there are daily excursions by boat that will take you to various beaches that are only accessed by the sea. We were very lucky to have found a hotel, Armonia Pension, that was just a couple of minutes walking distance from the center of Ios. The owner, Gianni, was very friendly and made us feel welcomed on the island from the moment we stepped our feet on the island. He offers free transportation to and from the port (very important because the port is not walking distance from the center). We went to Ios early July right before the high season (mid July to end of August) began. Therefore we were able to enjoy preseason prices, that is, 25€/night. There are a lot of hotels near the center so if you do not find a room here, do not despair. “Here is covered in the ground the holy head of the maker of heroes divine Homer,” (inscription on the marble plaque). 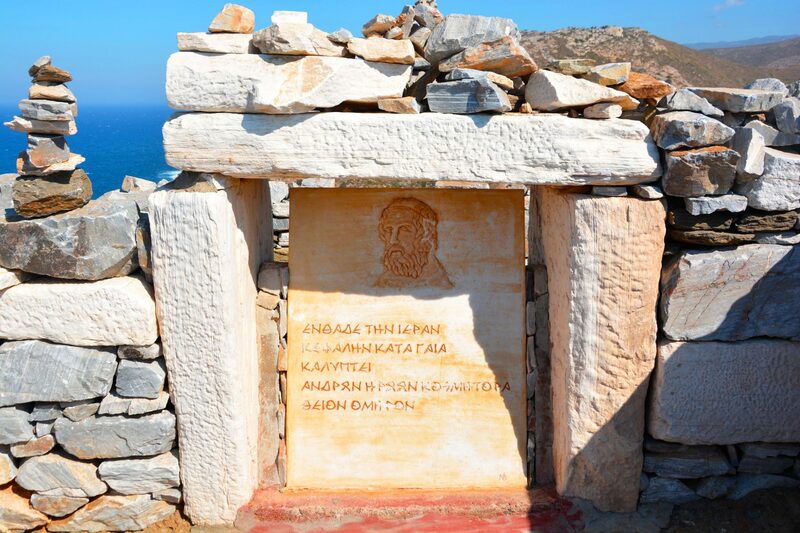 The island of Ios is considered to be the burial place of the great poet Homer. Tradition has it that Homer was buried here because Ios was the homeland of his mother. 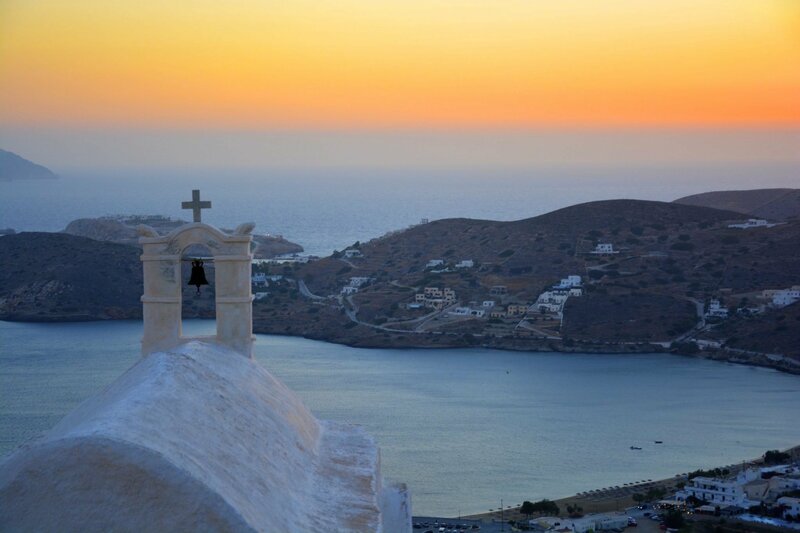 His tomb is situated on a beautiful hillside with the view of the Aegean Sea. If you have time to spare from beach hopping, this scenic detour is definitely worth visiting. There are daily boat connections to nearby islands that are worth visiting. 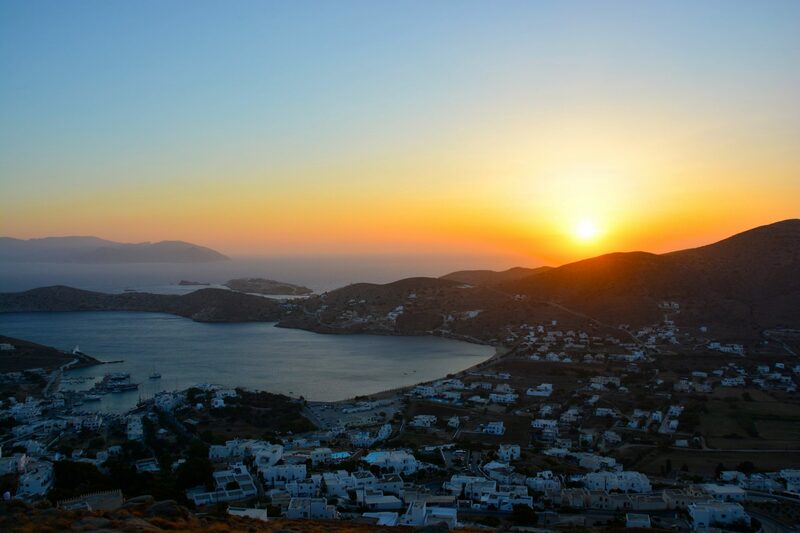 These include Paros, Naxos, Santorini, Syros, Tinos, Mykonos, Folegandros, Amorgos, Kimolos, Sifnos, Sikinos, Anafi, Serifos and Iraklion (in Crete). Times and prices of each ride depend on the day and season so be sure to check out the local tourist office for further information. For all those girls (and boys) that just need to buy something every time they visit a new place, Chora is just the place. It’s narrow white roads are filled with shops that sell clothes and gifts. My favorite shop was Innioranza. Owned by an Italian that loved Ios so much, he felt compelled to open a shop here. All of the items in the shop are individually designed by him. Notice how this is the only name of a bar/restaurant I’ve mentioned? I trust that you will find enough of those on your own. The island is not that big after all. 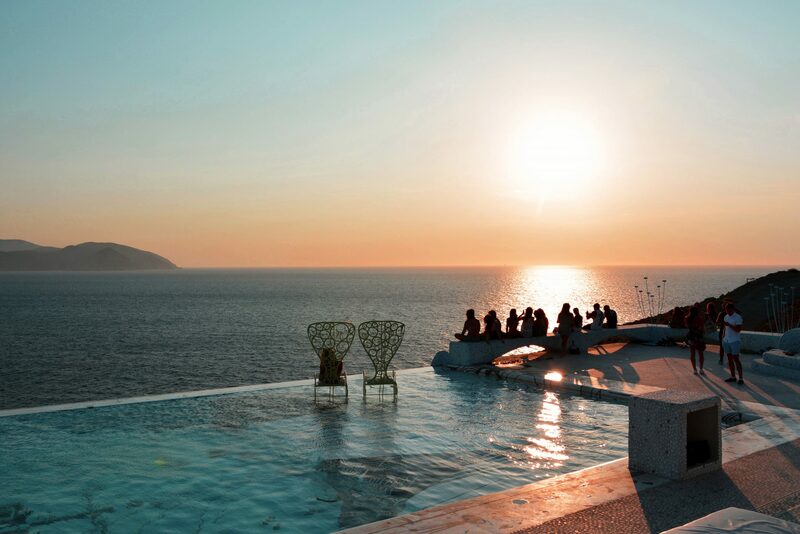 But, Pathos Sunset Lounge is a MUST! 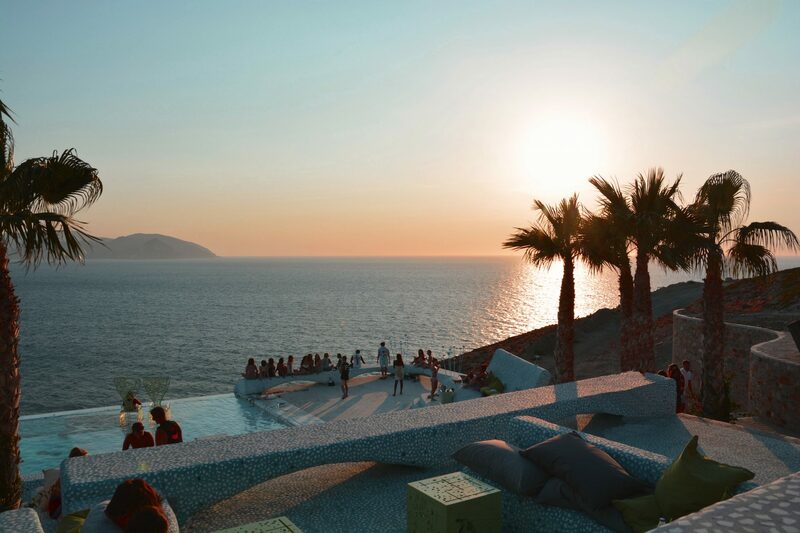 Situated right on the cliff side in Koumbara, this bar/restaurant offers a one of a kind sunset view of the whole Aegean. I especially enjoyed their infinity pool which really made you feel like you were swimming in the air. 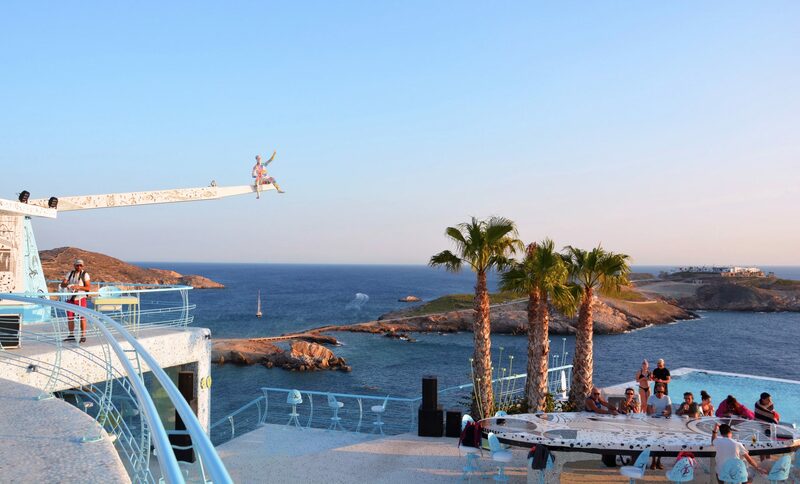 With renowned chefs, wedding ceremonies, special concerts and guest DJ’s, Pathos Sunset Lounge offers it all. I will let the pictures do the talking! For more info, you can find them here. I added the last three historic spots together because I believe that they can all be visited in one afternoon. The Odysseas Elytis Theater is right next to the Gaiti-Smiosi museum. 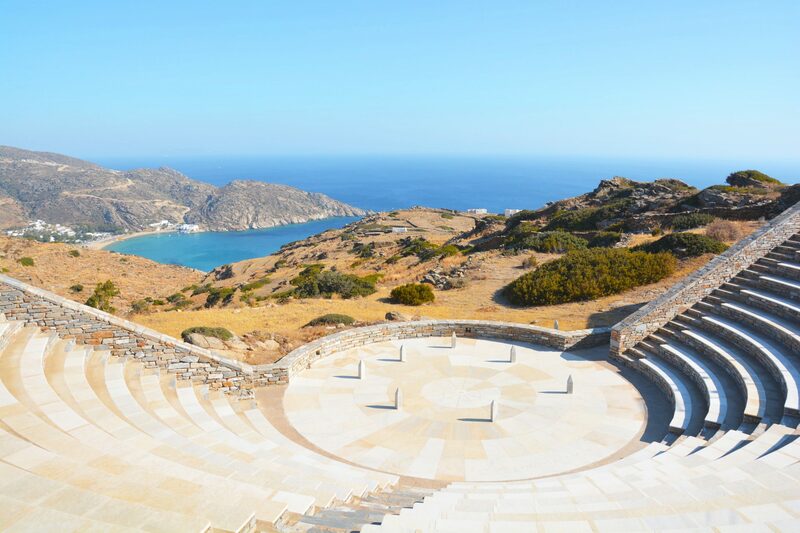 This ancient greek style theater hosts many theatrical plays and music concerts. However do not hesitate to visit even if there is no show going on to enjoy the view! Giannis Gaitis and Gabriella Simosi were two artists that fell in love with Ios and the Cycladic light. 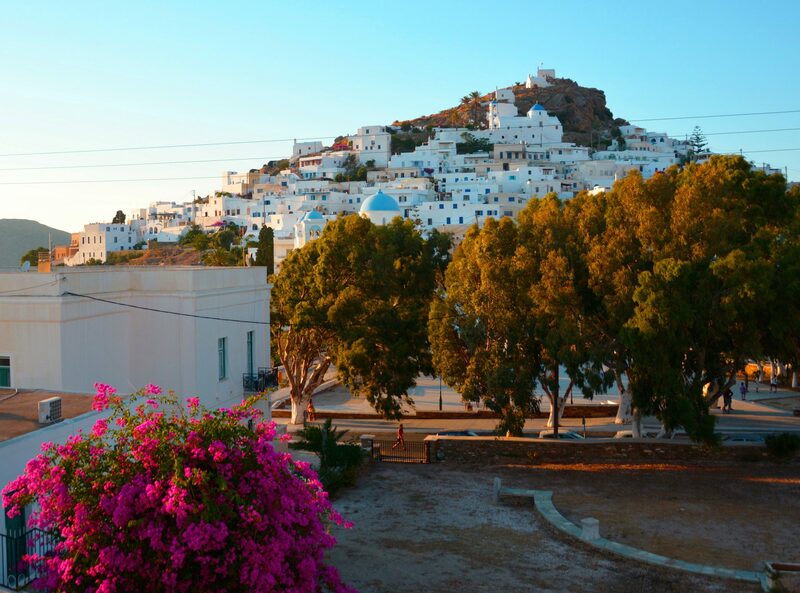 The Gaiti-Smiosi museum of modern art is at a high spot with the view of all of Chora. Lastly, the Archeological museum located in Chora exhibits objects from the Early Cycladic era and collections from epigraphs from Classical and Hellenistic times as well as the historic development of Ios. There are around 40 beaches on the island but only a handful of them are accessed by car. Some of the most notable beaches include: Mylopotas, Magganari, Aghia Theodoti, and Plakes. I will definitely make another post just on the beaches because there are just so many of them. 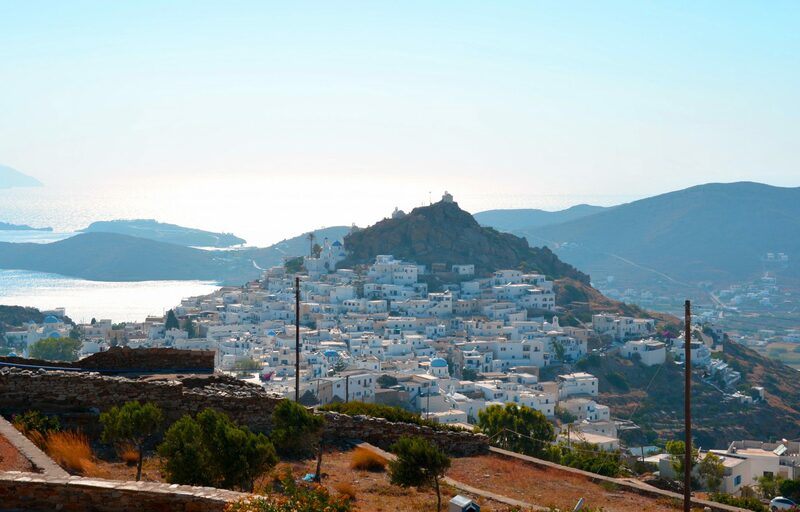 If you have limited time, or limited transportation, then Mylopotas is just a short walk from Chora. This beach is the most famous one due to its proximity to the center of the island. It is filled with restaurants and beach bars. Be sure to also check out the various water sports offered at Mylopotas Beach. I cannot write about Ios without mentioning its nightlife scene. During the day Chora is a quiet neighborhood full of shops and restaurants but during the night the clubs open and the center is transformed into one big party. Tourists from Australian, Northern Europe, and Italy, especially, come to Ios just for the party atmosphere. Indeed, infamous party stories have been passed down from generation to generation, making Ios a tradition for young partiers to visit this island. As a result, the average age of tourists is around 22. There’s no need to mention names as there are countless bars and clubs to visit. Just step outside of your hotel room walk to the center and your options are endless. 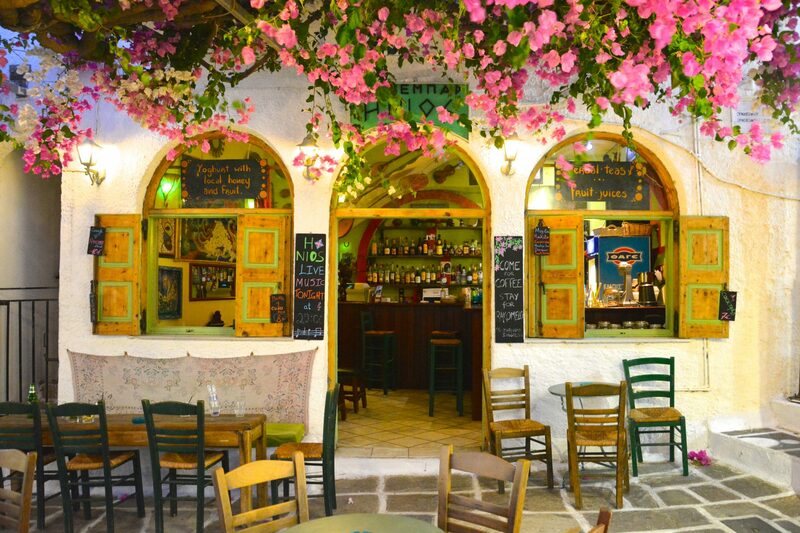 Most bars and clubs close 8 am, so there is plenty of time to bar hop and explore your options. Finally I want to end this post by saying that no matter what your intentions are for visiting Ios, whether it is for partying, or for visiting their beaches, one thing is for certain: you will absolutely fall in love with Ios. You can read more about my travels here! Help spread the word about Ios, Greece by pinning this!